Who knew 2015 would be delivering some of the best horror games in years? Even though adventure games have been coming back into style lately, that’s not really true of the isometric point-and-click. Stasis gives no fucks, though, and embraces its 90s heritage. Anyway, what I’m trying to say is that the video game industry has, over and over, refused to address my desperate need for horror in this format. It’s unfortunate, but Stasis tries to fix that. I’m not going to do more than give a barebones setup because unraveling what happened is the whole reason you’re playing. Drifting through space, a stasis pod lurches open, dumping you onto the floor. Covered in weird goo and having lost most of your strength, it becomes clear this is not the ship you fell asleep in. Your family was traveling to Saturn’s moon, Titan, when something happened. Blood, bodies, and other evidences of trauma are present everywhere. There are no humans to be found, either. It’s a bad way to wake up from a nap, you know? From there, you do as the genre prescribes: point and click. By hovering the mouse around, the game will produce descriptions of various things in the world. Sometimes, clicking on an object will result in the main character commentating on it—but not always. (The inconsistency is annoying.) As with most games like this, you end up clicking on everything just to experiment. Thankfully, actions in Stasis are contextual, so there’s no swapping between look at/pick up/sniff at and constantly worrying if the answer to moving forward is hidden in one of the many ways you can interact. Whatever the player is capable of doing, the game will make sure that happens when you click. If you can push something, for example, the icon becomes a hand. Stasis does a respectable job of walking the fine line between adhering to its nostalgic roots and trying minimize the genre’s worst habits, all without losing the reason you’d make a 2015 game like this in the first place. Besides exploration, solving puzzles is what you’ll spend most of your time doing in Stasis. That’s where most games like this get into trouble, forcing players to pixel hunt, in hopes of stumbling up on the item oh-so-cleverly hidden away. Stasis highlights some, but not all, of the most important interactions with a soft glow. It’s usually enough to lead you in the right direction, but in the three hours or so that I’ve played, I’ve still occasionally found myself combing through every single room two or three times to find the thing I didn’t click on. 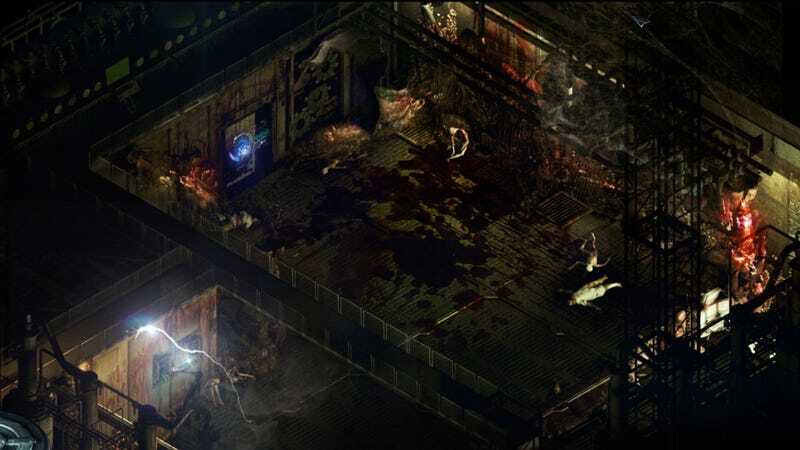 Whether that’s a flaw inherent to the genre or not is a debate for another day, but at least Stasis tries to contain each section to a handful of rooms, meaning you don’t have to do much backtracking. Also, it’s unfortunate the game doesn’t bother including any kind of hint system. But at least in the early hours, the puzzles aren’t that complex, so I haven’t been fully stumped. I’m glad, too, because what’s really pushing me forward in Stasis is discovering all the fucked up things that were happening on this ship, as things went to hell. Without delving into the plot too much, your main interaction with the human race comes through reading discarded PDAs and computer terminals and learning what it’s like to starve to death. Stasis relies on the boring trick that people spend their final days writing down their thoughts, but the way it plays out lends some legitimacy. Plus, they’re written pretty well. Much of it is optional, but it really fleshes out the destruction around you. The bloody bodies aren’t just there for show. If you’re wondering whether Stasis can scare you, you’re in luck. The game almost made me dump my laptop on the ground after a particularly nasty jump scare caught me by surprise. The game’s atmosphere is thick with tension, but it’s not trying to make you sweat the whole time, so the few moments it breaks things up and hits you with something shocking, it really works.